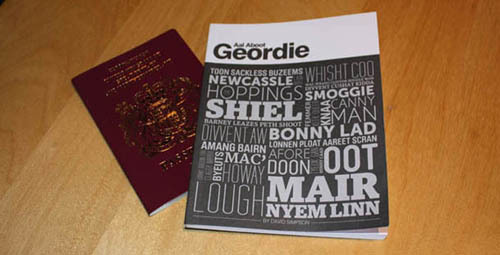 Geordie words beginning with F, G and H. The phrases in bold are translated at the end of the page. Faa: To fall, also the name of a Gypsy clan (the Faws) and a general term for a gypsy. Fadge: A kind of loaf / girdle cake. Fash and Fashed: To Trouble or to bother. Femmer: Fragile or easily broken. A Viking word. Geordie Dialect. This is a fern. Fettle: Mend fix, good condition, good health. In good fettle. Also ‘What fettle the day? – how are things with you today, what’s happening? Fine fettle means in good shape. Flummixed: Stumped in an argument, gobsmacked etc. Aw wes’ flummixed. Flee: Fly. ‘We flee oot on Satada’. Fond: Silly. Fond fyeul – a silly fool. Fond of a treat: Dicing with danger or difficulty. Force: Waterfall in Teesdale and Yorkshire but not in Weardale or Northumberland. Forry: Ferry. ‘Aw catched the varry forst forry’. Frae: From. The same as in Scots but much rarer in North East England. Frozzen: Freezing, feeling cold. ‘A’m frozzen’. Geordie Dialect. A radgie gadgie. 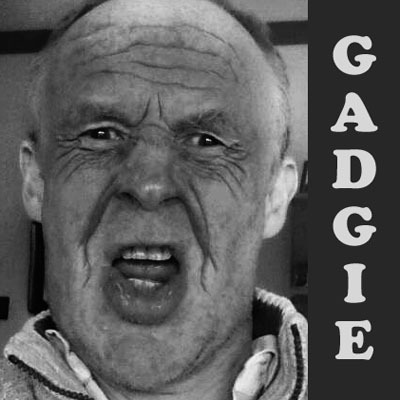 Gadgie: A man, usually an old man, an aad gadgie, or an official of some kind. Word of Romany gypsy origin. An aad Gadgie is an old man. Gaff: Old theatre or cinema. A cheap theate was called a ‘penny gaff’ or flea pit. Gan: Go. From the Anglo Saxon and Viking word for go. Gan Canny: Go carefully. Take care. Gan on the Hoy: To go out drinking. Gang: Variation of ‘Gan’, see above. Gannin: Going – Gannin’ alang the Scotswood Road to see the Blaydon Races. Ganny: Grandmother. Especially Sunderland and also South Shields. Ganzie / Gansey: A jumper / sweater. Garth: Yard or Garden. ‘Haad on ma, aw’s wetchin Garth Crooks on the telly’…’Nee bether, aboot time they catched those gnome thieves’. Gate: Usually means ‘way’ or ‘street’ often found in older North East street names like Gallowgate, Bondgate, Gilesgate. ‘Gan yer ain gate’ means go your own way. As in the well-knaan Fleetwood Mac sang ‘Ye can gan yer ain gate’. Gaumless: Stupid or useless. A Norse word. Geet: Geet. Very or great. ‘Geet walla’ means very big. Getten: Got. 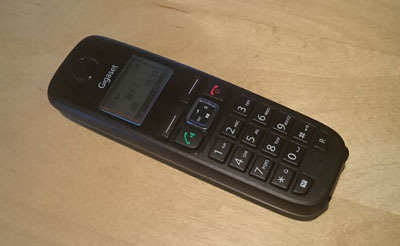 ‘Aw’s been getten a new fern’ – I’ve got a new phone. Ooo! Geordie: A native of Tyneside and especially Newcastle. Historically seems to have been a term for a North East pitman and not just those from Newcastle. Gie: Give. See also Give. Give: Given. ‘It was give to us. Give Ower or Gie Ower: Stop doing that, it’s annoying. Glaky: Awkward or slow in wit. Glower: Glare or to gaze in wonder. Gob: Mouth also known as a mooth. Good: Well, healthy. ‘Aw’s good thanks’. Googley: Staring, rolling prominent eyes. Gowk: A fool, a cuckoo (the bird) or also a core as in an apple core. Gox: God. As in Begox – By God. Grand-Da: Grandfather, especially in Durham but could also be Grandfatha’. Gyet: Gate or way, road etc. Haad: Hold can also occur as haud. Haad yer pash: Be patient. Hacky: Dirty. ‘Me spade’s hacky’. Also means Lazy. Hadaway: Get away – you’re having me on. Thought to derive from a naval term. Hadden: Get a hold of it. Hardlies: Rarely, scarcely. ‘A’wve hardlies bin thor. Hather: Heather also known as ling. Haugh: Pronounced Hoff or Harf – flat riverside land eg Derwenthaugh, Blakehopeburnhaugh. 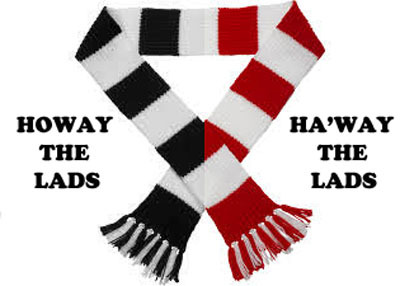 Haway: A Sunderland phrase of encouragement usually including a mysteriously placed apostrophe as in ha’way. The Tyneside equivalent is ‘Howay’ (which see also) meaning ‘come on’. ‘Ha’way the lads’ is often heard at Sunderland football matches. Heugh: A spur-shaped hill or promontory such as that at Hartlepool or Tynemouth or Segger Heugh. Hev: Have. ‘Te’ hev and te’ haad’. Hewer: Coal miner who works at the coalface. Holm: Island in a river or dry land surrounded by marshy land, river meadow. Honkers/Honkas: Ya’ honkas/ On your haunches. Was a popular resting/sitting stance of North East miners. Hope: A side valley, esepcially in the dales of Northumberland and Durham for example Hedleyhope. Hoppings: A fair or dance from the Anglo-Saxon word hoppenmeaning fair. The Toon Moor Hoppings are held in Newcastle. How: A call for someone to pay attention, be alert. See ‘How Man!’ below. How Man: Hey be careful man, calm down, listen to what I’m saying be sensible etc. Hoy: Throw. “Gannin on the Hoy” or “Gan on the Hoy” means to go out drinking. Hoyin’ Oot: Throwing out, or pub closure time. Hyem or Yem, Hame: Home. Scandinavian origin. More rarely occurs as ‘hame’ but that word is more common in Scotland. ‘Aw’s gan yem’ means I’m going home. A foolish person getting rather cold on a remote hill without a cell phone. Slow-witted old men going on their way rather carefully wearing trouser braces. Keep on going gentlemen. Come on my dear throw away your old half-pennies (they’re no longer legal currency – haven’t been for years).